Japan, which has developed and given many flowers to the Western world, has now literally given her flowering cherry trees by the thousands to the cities of Washington and New York, that they may form avenues of beauty along the banks of the Potomac and the Hudson, in repetition of the Mukojima, the world ­famous avenue of cherry blossoms along the river bank in Tokio. The gifts have been made so gracefully and so oppor­tunely as to enhance their charm, and it must be that the annual blooming of these beautiful trees will be "a perpetual re­minder of the friendship of the two peo­ples." The Japanese have given us their favorite, their own mountain flower, the soul of Japan, the symbol of all they adore and aspire to. "Charming sakura" they call it lovingly in the commonest form of speech. It is not mere "Prunus pseudo­cerasus, with profuse flowers and decidu­ous leaves," that comes to us as a nation's gift, but what they call "the most beauti­ful thing in all the world." No other flower in all the world is so beloved, so exalted, so worshiped, as sa­kura-no-hana, the cherry blossom of Japan. It is not only the national flower, but the symbol of purity, the emblem of chivalry and knightly honor, the crest of a cult the vernal celebration of which has been observed with unflagging zeal for at least two thousand years. It is Japan's own flower, more omni­present than the chrysanthemum, and in­digenous to the soil of the Yamato hillsides and to the heart of the "home provinces" that surround Nara and Kioto. It did not come from China, where the little white mountain flower is un-honored and un­sung, and it had reigned long in favor before the "new religion" came over from the mainland, with its lotus symbol and peony decoration. As early as the fifth century, the emperor and his court used to go to the "Palace of the Young Cherry­ Trees" near Nara to view the blossoms and make boating excursions about the cherry bordered lake. There were imperial garden parties then, when princes, priests, knights, and nobles spent their souls in sketchy odes, and tied the poems to the branches. A thousand years, and five hundred years more, have passed away, and the imperial garden-parties continue. Except Fujiyama and the moon, no other object has been theme and inspira­tion of so many millions of Japanese poems as the cherry blossom, and progress and modernity have not lessened its hold on the hearts of the whole people. All the emperors, "the one hundred poets," and all other immortals, have sung its praises, and in the trenches and dugouts and on the battle plains of Manchuria the soldiers made festival trees with bits of pink paper, or hailed a blooming crab­apple tree as the nearest substitute for their home blossoms. Painters, decora­tors, designers, artists, and artisans of every degree and kind have employed the flowers and buds more than those of any other tree. Forty cherry blossom crests are found in books of heraldry, and a cherry blossom superimposed on a chry­santhemum is the insignia of one of the princely houses. The young peers at the Nobles' School wear a metal cherry blos­som on their caps and collars, and in April all the sweets and cakes, and half the pretty things one eats, are in the shape of the five petal flower, or at least are ornamented with it. The court took the cult of the cherry ­blossom on from Nara to Kioto in the eighth century, and every spring trans­planted Yamato trees flushed the gardens and suburbs with rose color. Hideyoshi, the Taiko, man of blood and iron, but a flower worshiper extraordinary, exalted the cherry blossom to greater vogue, giv­ing garden-parties of ten thousand guests at his golden palace on Momoyama, and once summoning a company of the same number to the classic hillside of a thousand trees at Yoshino. The Tokugawa shoguns planted the cherry lavishly when they established their new capital at Yeddo, and there it reached its greatest development during the long peace of three centuries, when all the gentler arts flourished nobly. During these last centuries, the sakura has been petted, pampered, humored, studied, cultivated, coaxed, and forced, until more than one hundred and thirty varieties are recognized. The Yeddo gar­deners achieved their greatest triumphs with this flower, and wrought miracles there. The daimios vied with one another in their gardens, and gathered great al­bums of sketches of their best flowers. 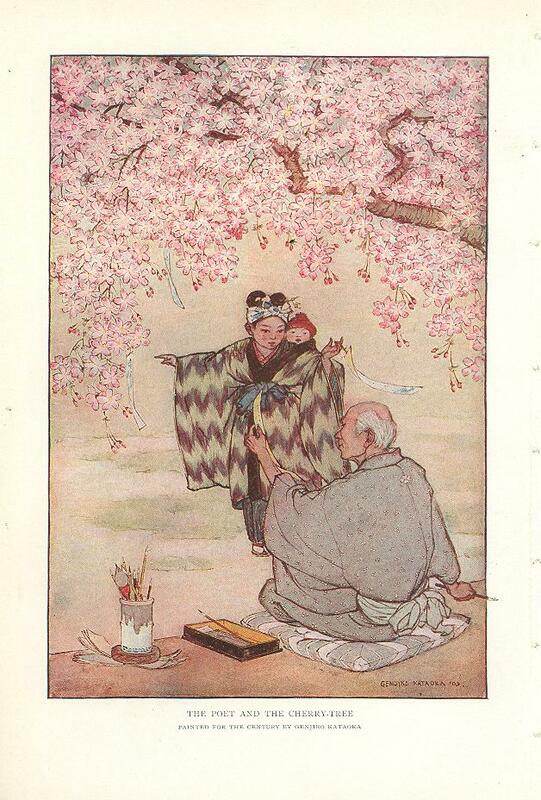 Little books were published about the cherry blossom, the text offset by colored prints that are gems of xylographic art. Since the Restoration of 1868 the culti­vation of the cherry blossom has gone to greater lengths, and, at the Imperial Bo­tanical Gardens, Professor Miyoshi, the sakura specialist, is assembling the text and plates of an exhaustive monograph on the cherry tree of Japan from the most modern, critical, analytical, and scientifi­cally botanical point of view, this final word about the honored blossom to be published in another year. The evolution of the cherry blossom from the simple, single, little, wild moun­tain flower to a great, wide spread, two-inch blossom, as big as a Cherokee rose, and to great rosettes of "many­ fold," "hundred-petal," and "thousand­-petal," flowers, is as amazing as anything in the necromancy of Japanese gardening. Beginning with the stock of the wild mountain, or Yoshino, cherry, the garden­ers grafted the shoots of the flowering va­rieties close to the ground, then enlarged the petals, changed stamens to petals, and multiplied the petals. These they curled in cuplike forms beyond the possibilities of a plum blossom, and, beside the one indenta­tion of the traditional heart shaped petal, cut deep notches like a sparrow's beak, or made serrated edges like the petals of a pink or daisy. They called the latter flower the "little chrysanthemum." They curled and broadened the stamen's, stood them upright like the sail of a junk, and in some cases left two pistils of pale green in the heart of the rosiest flowers as a charming color contrast. They also produced weeping or pendent branches and flowers, the most beautiful and graceful of cherry blossoms, and the first to bloom in the spring. In contrast to these softly swaying plumes of rose color, they evolved prim trees the flowers of which are like the wired constructions of our Western florists. Some blossoms, without visible stems, cling as closely to the twigs as plum blossoms, others swing on long flower stalks, .singly, in pairs, or massed in compact bunches like the "blob" in old hawthorn designs. After doubling and re­doubling the petals until each floweret was a miniature rose, they car­ried the color from white and blush pink through all the shades of rose and cerise to deep ruby and crimson. For long years the wonderful "Ukkon" trees flowered only in the palace grounds at Kioto, and it was only by imperial gift that these blossoms of golden yellow, emerald green, and pale blue, or "water­color," bloomed in other gardens. Now the Ukkon may be bought at any Japanese nursery. Nearly all varieties bear their blossoms on leafless branches, before the leaf buds have opened, but a few show a charming color contrast afforded by the tips of opening leaf buds. After the petals have blown away, "the snowstorms that are not from the skies, "the cherry tree clothes itself in green, and is only a common tree of restful color and grateful shade until frost ­time, when its rich brown and yellow leaves cling long to the gray satin twigs and branches. The first trees to bloom in the spring are the single white and pink yama (mountain, or wild) zakura and the Yoshino zakura, the original species from which all the hundred-and-odd varieties are descended. Bul­letins in the daily papers record the progress of the flower buds, and to their condition is accorded all the distinction that race-horses or prize-fighters claim in the Western world. After the weeping trees have POEMS HUNG UPON CHERRY. 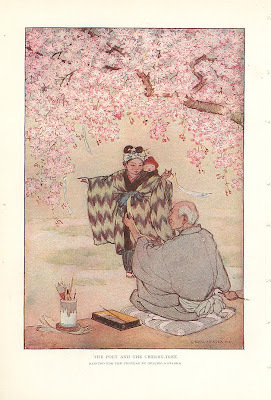 scattered their showers of blossoms, the higan (equinox)­ cherries bloom, and after them come the "many­-fold" or "thousand-fold" flowers, with a lavish blooming that is the last word for the cherry blossom. In anyone spot one is always sure of at least a fortnight's continuous feast of flowers. There are freak varieties of cherry that bear double and single blossoms on different branches or even on the same branches, and there are freak trees that bloom out of season and persist in doing it. 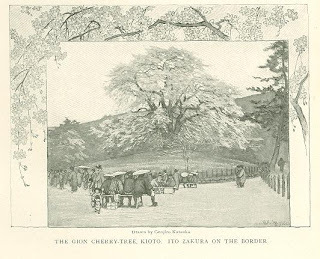 The most famous of these "fool cherry trees" (baka zakura) is , in Maruyama Park, Kioto, beside the gate leading into the Chion-in temple grounds. "The winter cherry," the stately Chion-in priests call it, and the botanists name it "the October cherry"; but to the populace it is al­ways the "fool tree." Its delicate little white stars of blossoms shiver in the raw winds of autumn, its petals falling with the first snow­flakes. There is also the "four seasons" cherry, which blooms that often in the year, and the "all-the-year-round," which blooms like a monthly rose. The October cherry originated with a tree that was prevented from blooming at the proper time by a very late spring, with many blighting frosts. When the frost-bitten tree recovered its strength, it did its duty and bloomed despite the season; and having once lost count, it has gone on with its foolish and abnormal proceedings ever since. The immortal "Sixteenth-day Zakura" of Iyo Province, the "Cherry-Tree with a Soul," that Lafcadio Hearn has immortalized in "Kwaidan," blooms on the sixteenth day after the New Year of the old lunar or Chinese calendar in the first days of March of the year, in which I made a pilgrimage to it. No one whom I questioned in Matsuyama knew of the famous sakura, and it was only by the clue given in "Kwaidan" that it was found. It was an achievement to discover the "Jiu-Roku-Zakura," and it was discovered in the queerest company, the blooming beauty of its branches shadowing brightly a group of shaggy, disheveled, melancholy Russian prisoners of war, pawns taken in the great game won at Port Arthur. Despite the presence of these aliens, the Iyo country folk had made pilgrimage to "the cherry tree with a soul" and hung it with poems to filial piety as well as to Japan's flower. The soul incarnate in the tree is that of an old man who, when near to death, prayed that he might live long enough to see this be­loved cherry tree bloom again. It was then the dead of winter, and only the plum trees were beginning to show signs of returning life; but the gods granted the prayer, the beautiful tree covered its branches with rose-pink flowers, and when the happy spirit had left the wasted human body, it entered the tree, and it lives there to this day - so the Iyo people say. In that year of the war the blossoms were. so pale as to be nearly white. "So much blood has been shed over there in Man­churia," said the priest of the temple, "that this year the cherry blossoms are blanched. " In the April sunshine - better still by moonlight, and best of all by the poet's pale, pure light of dawn - the blooming cherry tree is the most ideally, wonder­fully beautiful tree that nature has to show, and its short lived glory makes the enjoyment the keener and more poignant. Light radiates from it. There is a soft, pink electric glare overhead, beneath, and "all around when one stands under branches laden with masses of flowers even more compact than any green foliage that grows. Wind and rain make havoc with buds and petals, and rain is the April rule in Japan. With its flowering, its mission is accomplished, for the Japanese cherry­ tree is not a cherry tree in our practical, material sense. It does not have to work for a living, and produce a crop for the market. When its burst of beauty is over, nothing more is expected of it. Its whole strength is well and wisely spent in flow­ering, and it rests in peace until the season rolls around again. "But, do you know," said a Japanese friend, lowering his voice and speaking as if he were relating a great scandal, "those cherry trees have only a very poor, mean little flower, no good, not beautiful at all." 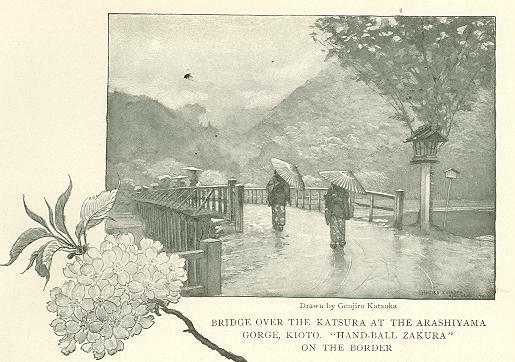 Here was the whole racial point of view as far apart as possible, our trees named, known, and valued for their fruits solely, the Japanese loved for their flowers. 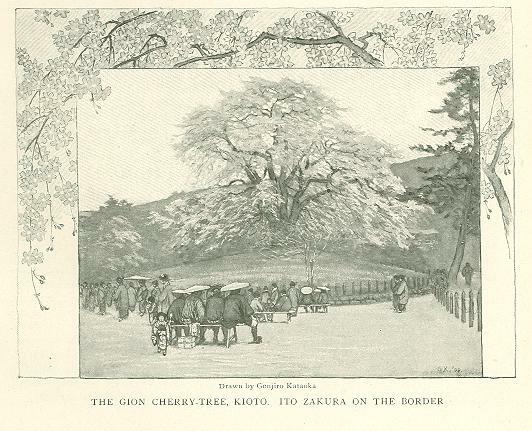 The cherry blossom in history and leg­end is as old as the empire. Yamato Take, the early hero who conquered the aborigi­nes, accomplished prodigies of valor, was the first exponent and exemplar of Bushido, "the knightly creed," and per­sonified Yamato Damashi (the spirit, the soul of Japan), was one of the earliest knights of the order of the cherry blossom. The spirit of martial valor, truth, honor, and fidelity were more than ever associated with the cherry blossom during the roman­tic and picturesque career of the emperor Go Daigo, who was a fugitive in the Yo­shino mountains for more than three years. He was a gay Prince Charlie for adven­tures and gallantry, and his personality is as all pervading in the Yoshino neighbor­hood as the cherry tree itself. One place of pilgrimage for the admiring is to the spot where his faithful retainer Bingo no Saburo wrote a message to him on the bark of a cherry tree when he and his master were captives in different parts of the enemy's camp. Everyone who has cherry trees at all has at least a Bingo no Saburo zakura for sentiment's sake, and shows with pride the tiny white flowers, accompanied by full grown green leaves and red leaf buds. We, too, have a legend connecting our cherry tree with the first and greatest of all Americans, but how do we treat it? Every child knows of George Washington and the cherry tree, but takes it as a joke, a matter of horseplay, and only the toy tomahawk is associated with the hero and his deed. No one associates George Wash­ington with the tree's beautiful blossoms, and no one wears a cherry blossom in his coat lapel on Washington's Birthday, as a primrose on Primrose Day keeps green the memory of an English statesman. And who ever makes pilgrimage to Westmoreland, where that immortal cherry tree grew, or seeks scions and grafts from the cherry ­trees at that old Washington home? Everywhere in Japan the gala season of the year is when the cherry blooms. Everything leads up to, waits upon, and dates from "the time of the cherry blos­som" far more than from "the time of the chrysanthemums," and in that month the whole empire is wreathed in rose color from Kiusiu to the farthest north. Everyone goes to see the cherry blossoms as a matter of course. No one foregoes a sight of the "charming sakura" of his neighbor­hood, and the very poorest will trudge to some famous place to see some historic tree when they cannot pay the low rates at which all railroads run the many special cherry blossom excursion trains. Prince Ito took as much pride in the avenue of cherry trees and the perfect specimens of rare trees blooming among the evergreens of his Oiso villa, down on "the brocade coast," as in the realization of his great­est dreams of empire. 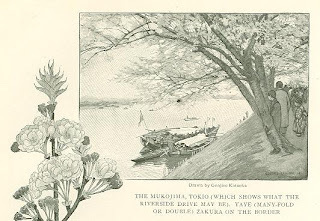 Admiral Togo has planted cherry trees to commemorate his visits here and there, as has General Nogi, and both have written poems to knighthood's flower. Yoshino, a mountain village on the crest of a ridge in the heart of Yamato, which is "the heart of Japan," is a synonym for cherry blossom and a synonym, too, for poetry and beauty throughout Japan. Once capital of the empire, it now sleeps for all save the two weeks of the year when the nearby population flocks there to see "the hillside of a thousand trees," "the thousand cherry trees in the middle way," and "the thousand cherry trees in the rear," as they have done for more than fifteen centuries. Many of the gnarled old trees look all of that age; and their masses of pale blossoms are compared to bleaching linen and to waterfalls. That special "hillside of a thousand trees," above which rises the mile-long line of Yoshino's village roofs, is the greatest graveyard of poetry the world possesses, for ever since the art of writing has been known, every spring those tree branches have fluttered with poems by the thousand. The greatest day that poetry ever had on that hillside was when Hideyoshi gave his garden party of ten thousand guests. All the princes and daimio!? of the empire were bidden to Yoshino, and they came, each with his train of followers in gala array. They adored the fragile mountain flowers, they sipped cups of salted cherry blossom tea, everyone dashed off a poem and left it to flutter in silent praise, and they solid­ified the Taiko's power and convinced one another of his greatness and of his firm grasp of the machinery of government. After Yoshino, Kioto has its own festi­val in praise of the cherry blossom, and pink branches show the whole length of the Maruyama hillside, which walls the city on the east. There are cherry-trees, cherry-trees, cherry-trees everywhere, and again cherry-trees and more cherry-trees. All Maruyama Park is transformed with clouds and drifts and plumes and billows of pale pink, and with brilliant masses and pyramids of vivid crimson against the pines. 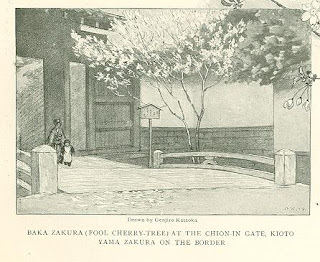 But the cherry tree of all Japan is that enormous old weeping cherry between the Gion Temple and the Chion-in Gate, official harbinger of spring, first to burst into bloom for all of its one hundred and thirty years. It was long immured in a labyrinth of courts and hidden by the hud­dle of roofs. Progress was to be praised when it swept away the raft of little houses clinging like mud swallows' nests to the Gion precincts, and let the great tree emerge in the open, standing en­throned on a high circular terrace in the new park. It is a noble old tree, with thick trunk and enormous branches that are drawn out and supported by many posts and props; and when it is abloom to the very crown, and the down dropping blossoms descend in showers from every pendent twig, it is a sight worth traveling far to see. Banners on high proclaim it by day, and lanterns, picturesque pine torches in iron baskets, electric lights, and colored fires exalt it when daylight fades. By lantern and firelight, the clouds of blossoms are more enchanting than by day, and the name of "cherry-blossoms of the night" has fastened to it. After the Gion tree, bloom the ten thou­sand cherry trees which an abdicated em­peror of the thirteenth century brought from Yoshino and scattered through the forest of pines and maples clothing the front of Arashiyama, which is another synonym for cherry blossom throughout Japan, a steep hillside which reflects itself in a broad mirror of a stream in the west­ern edge of the Kioto plain. The Maiko­dori, a dance in praise of Kioto and the cherry blossoms, is given in the festival month at the geisha theater in the city. In Tokio, the first festival is at Uyeno Park, the people's pleasure ground sur­rounding the mortuary temples of the To­kugawa shoguns, and the veteran yama and Yoshino zakuras tower in air as rosy clouds by day, with pillars of ruby fire where weeping cherries bloom against the background of the great picture pines. A week later, the Mukojima, a roadway along a river-bank, becomes fairy-land in a night, a mile-long tunnel of blossoms, where the branches meet overhead, and through which all the million inhabitants of Tokio seem to stream in unceasing pro­cession day and night. No vehicles are permitted; policemen keep the crowds moving; double rows of tea houses, booths, shops, and sideshows tempt the throngs; and houseboats and college crews make the river like another carnival. It is the festival of the common people, very often a rollicking saturnalia, for the miles of fairy flowers are matched by miles of sake tubs, and this mild rice-wine is a cheerful, laughter - stirring drink, with no fighting qualities in its brew. "Without wine, how can one enjoy the view of the bloom­ing cherry?" sang the Emperor Richiu fifteen hundred years ago, when a petal fell in his wine cup. The Edogawa, a canal in the Koishikawa quarter, near the arsenal, is a mile of double blossoms doubled in beauty by re­flection, and boats go up and down this lane of flowers as the most beautiful of all cherry blossom effects. At Koganei the banks of the aqueduct conveying the city's water supply is or­dered with cherry trees, ten thousand of which were sent up from Yoshino by the shogun Yoshimune in 1735, he believing that the purity of the blossom would pre­serve the purity of the water. When one has seen the cherry blossom in Japan, the long avenues of flowers, the parks filled with billows and clouds and banks of rose color, the veteran landmark trees receiving their annual homage, the very visions of the jeweled trees of the Western paradise, he wonders why the Japanese cherry tree has not been planted in all our Western parks and pleasure­ grounds. For twenty years it was as one crying in the wilderness that I begged to have the Japanese cherry tree planted in Washington parks, more especially on the reclaimed land along the Potomac River, where, since they had to plant something, they might as well plant trees that would ­afford an annual flower show at the season when all Washington is at home and the city receives its greatest number of visitors and sightseers. Amiable army officers lent weary ear to the tale of the Japan­ese cherry blossom and the future fairy­land, but none grew excited or was con­vinced. Last April an appeal was made to Mrs. Taft, then endeavoring to make the Poto­mac Park a meeting place for all society on the afternoons of band concerts. A note was dispatched on Monday morn­ing making the time worn plea for the Japanese cherry tree, and on Wednesday the response told that the order had been given to procure all the cherry trees avail­able in the nearest nurseries and set them out immediately. On Thursday the news of this prospective Washington Muko­jima reached the ear of Dr. Takamine, the well known chemist, who for many years had tried as vainly to convince the New York park commissioners that the River­side Drive along the Hudson was the ideal place for planting miles of cherry­ trees. With Mr. Midzuno, the Japan­ese Consul General in New York, he asked to have it ascertained if Mrs. Taft would accept the gift of a thousand cherry trees from friends of America in Japan. On Saturday the proffered trees were assured a hospitable welcome, and the thing was done. When the graceful act was recorded in the newspapers, an editor headed the item: "Chance for two thousand hatchets." Another editor sug­gested as a return gift "a hundred barrels of cocktails." No wonder there are cavil­ers who ask, "Are we a civilized people?" Two thousand cherry trees eight and ten feet in length, grafted with the ten choicest varieties of flowering stock, were presented by the Mayor of Tokio, and left Japan last November. They reached Seattle in December, and were sent across the continent in special refrigerator cars, and during the winter have been guarded by the agricultural experts in Washington against planting time in March or April. 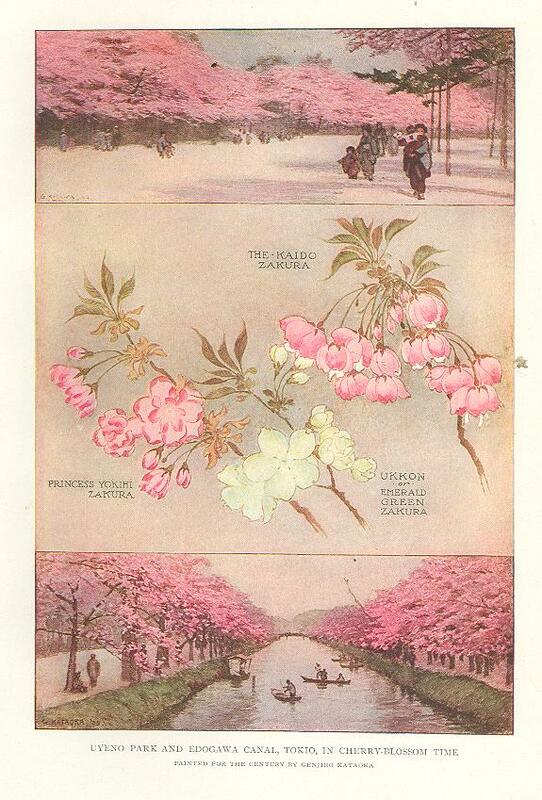 The strategy of Dr. Takamine at the time of the Hudson-Fulton celebration secures an avenue of cherry trees for New York, so that by grace of Japan the metropolis as well as the capital is to have its Mukojima. Originally published in the Century Magazine. March 1910.